Picture a third-grader who, when first entering Cathy Allen’s classroom, brought a sense of wildness, anger and bewilderment with him; a young man who lashed out at teachers and peers alike. Picture him later as he expresses sorrow that a four-day weekend is coming up. He doesn’t want to leave the classroom – a place where he feels safe, accepted and loved by all. These young people were fortunate to be in a school that had become a safe and caring Learning Community dedicated to developing children in all of their social, emotional, intellectual, physical and ethical/moral wholeness. This school, like thousands of others throughout the United States, Canada, Australia and other countries accomplishes this by creating and sustaining a caring and challenging school culture – an environment that provides a sense of belonging, support, connection to others and to ideas and values that make young lives meaningful and significant. Decades ago, respected educator John Dewey urged that each public school should be a model home, a complete community. It would be a school that had a shared vision, realistic goals for children’s development, and a caring way for people to be and learn together. Not only would such a school energize students but make it safe and exciting enough to learn.2 Now more than ever, almost a century later, this still needs to be our quest. Consider what typically would have happened to Mrs. Allen’s third grade students in a school that either would have dismissed, admonished or labeled the behaviors as “learning problems.” More likely than not, in time the self-confirming images of her two students would have led them on tracks of alienation and failure. Massive categorical funding has been and continues to be allocated to deficit-focused programs for special education, individual treatment and costly remedial strategies. The problem focus persists in spite of comprehensive studies and consensus among informed educators that rather than continuing to try to “fix kids”, we need to fix the deficit-focused system. That means challenging schools to be strength-focused on students’ development in the fullness of their interests, ways of learning, gifts and humanity. Longitudinal studies on positive protective factors that when present in child rearing or learning systems foster resilient strengths, well-being and success in life success. First, let’s look at what can be learned about learning. It is startling to realize that scientists have learned more about the human brain during the last decade than during the entire preceding century. 3 One of the most important factors that make every child unique is that the body, mind and brain operate in a dynamic unity. This means that no longer can the body-mind-brain unity be ignored in favor of filling students’ brains with concepts and information, and counting on the practice as the guaranteed path to academic achievement. Where is there to be found a single piece of authentic research that proves this is how the human brain learns best? Today it is well-recognized that cognitive information becomes meaningful and more lasting when coupled with application and experience. Moreover, the chemistry and structure of the brain changes in response to the environment, prior learning, remembered experiences, beliefs and values.4 All of which demystifies why it seems more difficult to reach and help today’s 21st century youth achieve academically. The chemistry and structure of their brains have been conditioned by being raised in an instantaneous change environment filled with visual and sensory stimuli from computers, television, cell phones, electronic games, I-Pods etcetera – all of which most enjoy and are proficient in using. This may be the prime reason that we lose young learners with traditional direct instruction, listening passively to teachers, now and then answering questions and filling in worksheets – the latter which do not grows dendrites. Knowledgeable school systems and teachers are engaging students by using cooperative learning, active group inquiry and participatory projects. Perhaps more than all else going on for school reform, teachers’ onsite professional development with their peers in on-going small learning communities is proving to be highly effective.5 Together they learn about learning, cognitive theory, collaborative group structures, students’ developmental needs and how to create supportive classroom environments. Are you aware that the daily culture of the school is the primary factor that supports students’ development and academic learning? Many probably would reply, “No, it’s the curriculum!” And that would lead to enlightening folks with a few facts that curriculum cannot change. Children who come to school from a stressful less than supportive or caring environment carry the stress all day and everyday to school. They may be like the two third graders above or they may be disillusioned secondary kids. Traditionally they have been referred to as “kids at risk” affected by outside factors in their lives that the school cannot fix. However, the impressive longitudinal studies on environmental factors that enable humans of all ages to overcome deprivation and adverse conditions in life, give schools a clear way to establish a caring strength-focused culture that nurtures resilient strengths in all students (-and teachers too!) within the system.6 Schools committed to having all kids “at promise” rather than any “at risk” create and sustain caring community environments that activate the following three categories of well-proven positive protective factors. Caring and supportive relationships – Caring relationships within systems convey compassion, understanding and respect. They are grounded in attentive listening and establish safety and basic trust. Positive and high expectations – High expectations communicate firm guidance, structure and challenge, and most importantly convey a belief in a young person’s innate resilience. They highlight strengths and assets as opposed to problems and deficits. Opportunities for meaningful participation – Opportunities for meaningful participation, leadership and contribution to the community may be actualized through decision making, listening and being heard, with each person being included with valued responsibilities. It is no surprise that these protective processes work. They meet our basic human needs for love and belonging; for respect, challenge and structure; for involvement, power and ultimately, meaning. They meet every child’s need to be included, recognized and values by others. The question becomes, how can we bring this about for all of the students in our school? The approach involves all of the groups mentioned above in long-term membership in mini-communities (groups of 4-6 members); parents in classroom groups, teachers in faculty groups and students in cooperative learning tribes. The structure provides inclusion, a sense of value and community for everyone in the groups. The communities learn and use a series of collaborative skills and help each other honor four positive agreements: attentive listening, appreciation/ no put-downs, the right to participate or to pass and mutual respect. The positive agreements (norms) assure appreciation for each person’s culture, race, gender, abilities, contributions and uniqueness. The sense of community that all age groups seem to seek today becomes a reality as people work together on meaningful goals, tasks and challenges. Strength evolves out of the special quality time that is spent to build inclusion whenever the groups come together. No one is an isolate, no one fears to talk. It is safe enough to ask questions – safe enough to learn. 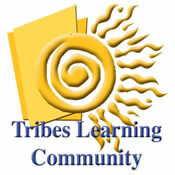 Every active learning academic experience (lesson) in a Tribes classroom has two objectives: the content to be learned and the social skill to be practiced. Each lesson begins with the teacher announcing the objectives to the students and each learning experience concludes with student groups reflecting on or assessing the extent to which they achieved the objectives while working together. Comprehensive studies repeatedly have proven that cooperative group learning and the reflective practice improves student active learning.10 It is compatible with how the human brain constructs, processes and retains information for extended periods of time. If indeed we want to improve academic test scores, teachers need to learn how to transfer leadership and individual accountability to peer groups. Studies have shown that group interdependence consistently increases student achievement more than individual control methods.11 The inclusion and safety within caring groups takes peer leadership and responsibility to exciting new levels for children and youth learning and development. Educator Ron Miller reminds us that ultimately our work is not about a curriculum or a teaching method… it is about nurturing the human spirit with love. 12 The many problems of youth can be lessened and healed by transforming schools into caring communities, by including youth as leaders in solving problems and in reaching out in kindness to each other. I believe that John Dewey was right. Each public school should be a model home, a complete community actively developing future compassionate citizens capable of creating, leading and contributing to the kind of democratic communities – in which we all long to live. 3. Wolfe, P. Brain Matters: Translating Research into Classroom Practice .Alexandria, VA: Association for Supervision and Curriculum Development, 2001. 4. Pert, Candace, B. Molecules of Emotion: The Science Behind Mind-Body Medicine. New York, NY: Simon and Schuster, 1997. 6. Werner, E. and Smith R. Overcoming the Odds: High-risk Children from Birth to Adulthood. New York: Cornell University, 1992. 11.Stevens, R. and Slavin, R. The Cooperative Elementary School: Effects on Students’ Achievement, Attitudes, and Social Relation. American Educational Research Journal, Vol. 32.